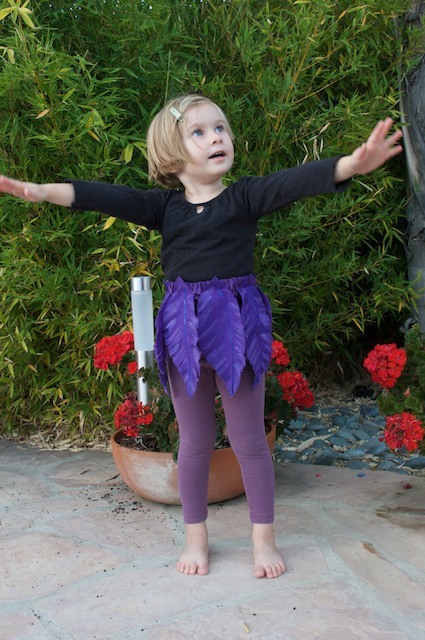 P has been asking me to make her a fairy costume for a while now. 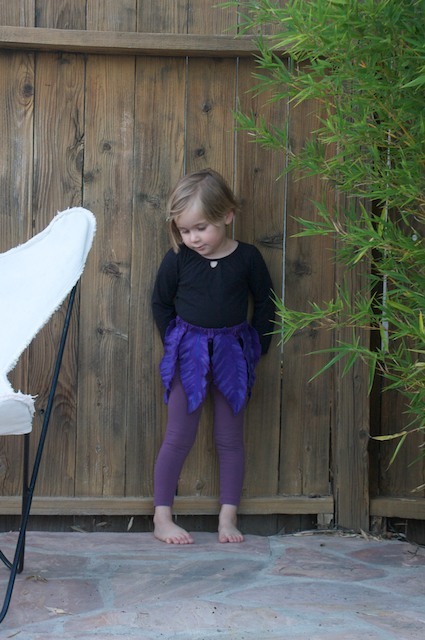 I’ve never made any kind of tutus or this kind of costume so I was a little gun shy to try. But since we had the long weekend I thought I’d go for it. When we were in the fabric store I asked her who she wanted and she said Vidia. Of course, one of the hardest ones. I used this picture as reference. And so the fairy adventure began. My initial thought was to find flowy, sparkly, fabrics but Vidia’s skirt is actually feathers so I got purple canvas instead. I bought 1 yard, which turned out to be too much. For a 3.5 year old with a 19″ waist half a yard is plenty. I probably could have had one or two more feathers to her costume but the seven I made were fine. 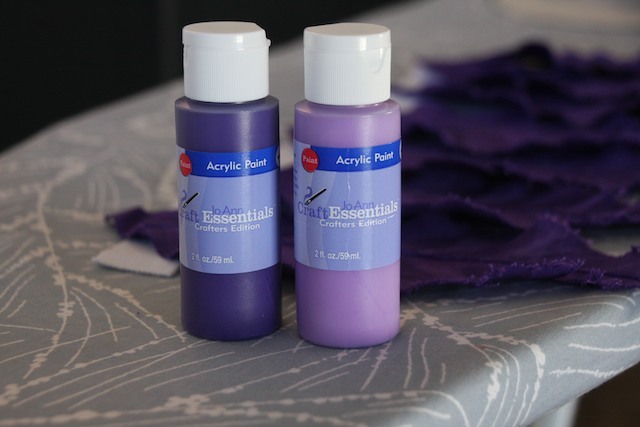 I also bought wide elastic waist band, 2 different tones of purple acrylic paint for porous surfaces (one lighter than the fabric and one darker), one puffy purple fabric paint, and purple thread to match. 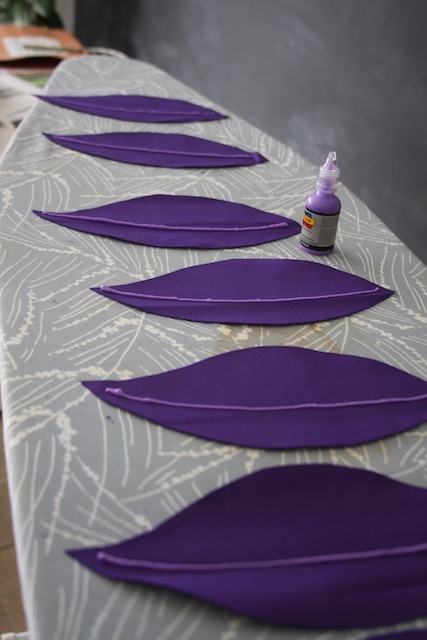 I eventually bought 1/4 yard of a silky-type purple fabric to cover the waist band as well. My initial thought was to cover the entire waist band with the feathers. It started to look too cluttered with so many feathers so I needed to cover the white band with purple fabric. I started by drawing out my own feather pattern. 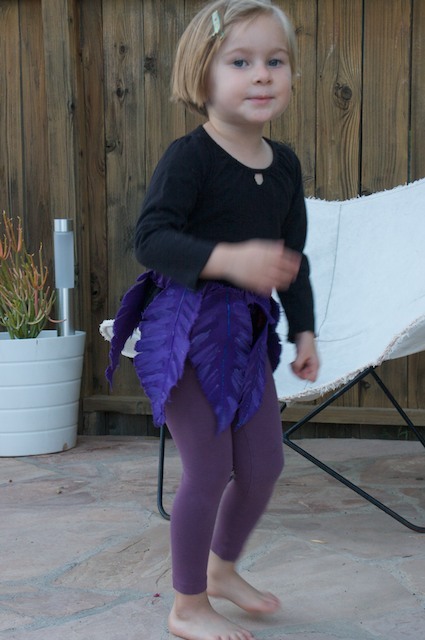 I measured one of P’s ballet skirts and it was 19″ long so I used the same length to make her feathers. 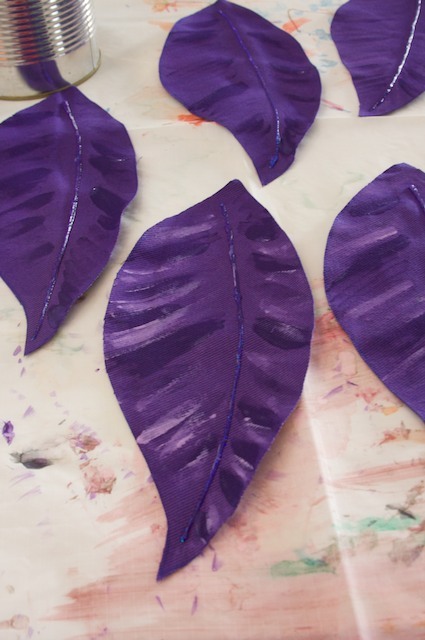 After cutting them all out, I used the puffy paint to make a “vein” down the middle. That took 4 hours to dry so I came back to the project the following morning. 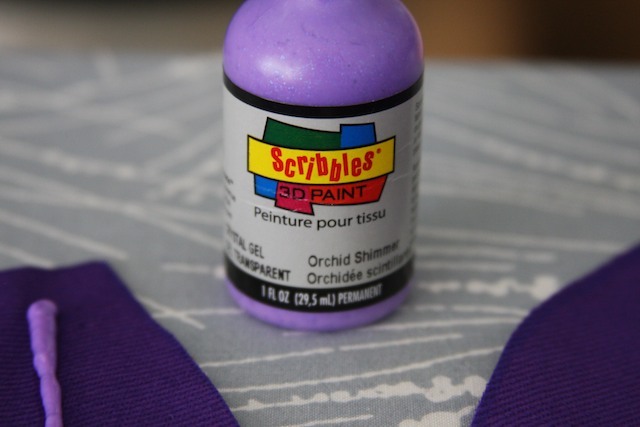 The following morning I noticed that when the puffy paint dried it turned clear and sparkly. I would have liked it to stay the same color in the bottle, but oh well. Next, I drew the wispies of two varying colors on all the feathers. P helped but then got frustrated. 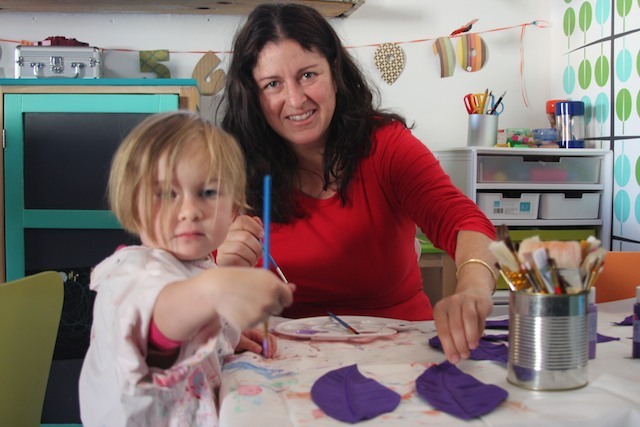 She wanted to paint other kinds of patterns and I kept telling her she wasn’t going to look like Vidia. We did have fun for a while though and she did feel like she was part of the process so that was great. Me sporting a great morning look. I bought the least expensive acrylic paint. It was the JoAnn Fabric brand for 52 cents. I did have to put on 2-3 coats (I did not wait the recommended 1 hr before reapplying) and it finally started showing up instead of vanashing when dry. Overall the cheap stuff worked great. When the paint dried. I frayed the edges and cut small slits up each side of the feather to give them a more realistic feel. The feathers, the hard part, was finished. Next the waist band. This next step reminded me of when I use to make scrunchies in the late 80’s. P’s waist is 19″ so I cut a piece of elastic waist band to 19.5″. Then I cut a piece of purple silky fabric wide enough to cover the elastic waist band plus some for folding over on each end to make a clean hem. I sewed the two ends together making a hollow “hose” with the fabric to then insert the elastic band. I made the mistake of initially cutting the silky fabric to 19″, the same length of the elastic. The silk has to be 2 times longer than the band so that when you stretch the band there’s enough material to stretch with it. 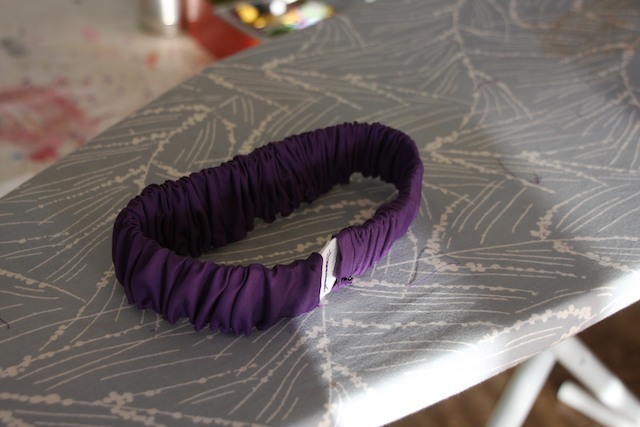 I sewed the two ends of the band together then sewed the purple silk fabric together, overlapping it and then sewing right through with the band. Finally I got to place the feathers on. 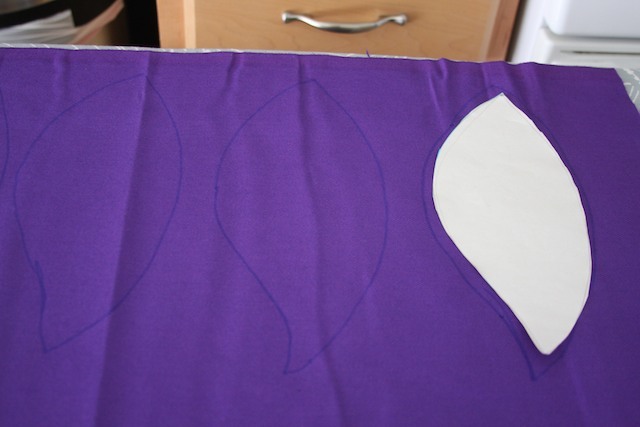 I pinned them first for placement, then I sewed one straight line horizontally across the top of each feather. I sewed “with the grain” of the elastic band. I was afraid that if I sewed too much on each feather the elastic would not stretch. So, the skirt is done. I could try to make her a vest like the one Vidia wears but instead I think I’ll just get her a purple body suit. She has leggings that will work but of course got them wet right before I finished sewing the feathers all on. Definitely not as hard as I expected. Plus it was a lot of fun to do and P is over the moon that she looks like a fairy!!!! Yea!!!! Hi, I love your ideal for the feathers. 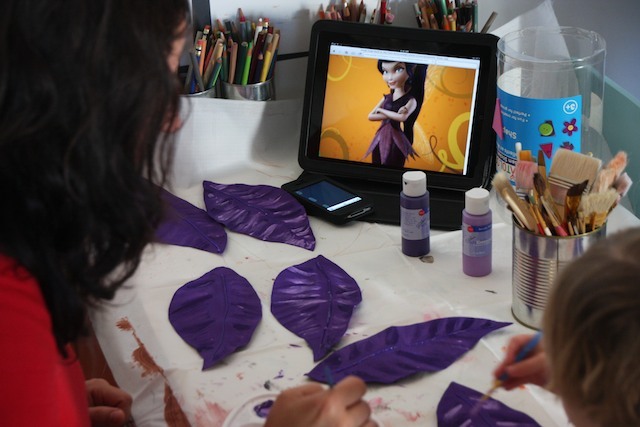 I am making a vidia costume for my daughter for Halloween. Since we are going to Disney for the Halloween party I am trying to make this as real looking as possible. I knew real feathers would just get to messed up from her sitting in a stroller or on rides so I went with your fabric ideal. I was just wondering if you could show a closer picture of how you cut them to make them more realistic. Thanks again. Michelle.